Now we want the world to know: we survived, we are free, we love life. 'On May 6, 2013, Amanda Berry made headlines around the world when she fled a Cleveland home and called 911, saying: "Help me, I'm Amanda Berry . 'We have written here about terrible things that we never wanted to think about again . . . Now we want the world to know: we survived, we are free, we love life.' On May 6, 2013, Amanda Berry made headlines around the world when she fled a Cleveland home and called 911, saying: "Help me, I'm Amanda Berry . . . I've been kidnapped, and I've been missing for ten years." A horrifying story rapidly unfolded. Ariel Castro, a local school bus driver, had separately lured Berry and two other young women, Gina DeJesus and Michelle Knight, to his home, where he trapped them and kept them chained. In the decade that followed, the three girls were frequently raped, psychologically abused and threatened with death if they attempted to escape. Years after she was taken, Berry had a daughter by their captor, a child she bravely raised as normally as possible under impossible conditions. Drawing upon their recollections and the secret diary kept by Amanda Berry, Berry and Gina DeJesus describe the unimaginable torment they suffered and the strength and resourcefulness that enabled them to survive. Pulitzer Prize-winning Washington Post reporters Mary Jordan and Kevin Sullivan interweave the events within Castro's house with original reporting on the efforts to find the missing girls. 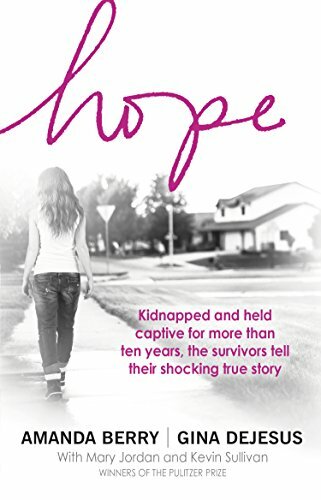 The full story behind the headlines - including details never previously released on Castro's life and motivations - Hope is a harrowing yet inspiring chronicle of two women whose courage and ingenuity ultimately delivered them back to their lives and families.